Trimec Flow Products Multipulse positive displacement flowmeters utilises the widely accepted oscillating piston design principle with the performance enhanced by the use of modern engineering materials to provide a cost effective and reliable solution for a wide range of industrial flow measurement applications. It’s simple and robust design offers the advantage of only one moving part with both high resolution open collector and reed switch outputs as standard. As each piston rotation passes a known liquid volume, the inherent repeatability of the Multipulse positive displacement flowmeter makes it particularly suited to batching and dispensing duties. Commonly metered liquids range from non-conductive low viscosity solvents through to extremely viscous lubricants, chemicals and food bases. Application flexibility is further enhanced as meter performance is independent of flow profile eliminating the restrictive need for straight pipe runs required with most alternate metering technologies. Multipulse has no stagnate chambers to harbor contaminants. 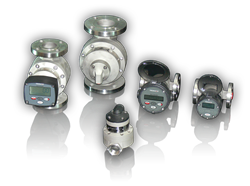 There are no restrictions on mounting orientation and the flowmeter may be operated under vacuum flow, pumped flow or gravity flow conditions.